Butter doesn't make things moist. Moisture is the presence of available water. Fat and water do not mix, actually fat is a barrier for moisture. Having said this, butter does contain about 14-16% water.. (confused? ), but this water is trapped in an emulsion. Once butter melts, that emulsion is broken and water separates out. In an attempt to make your favourite cookie, cake or brownie recipe more moist, re-consider pulling a Martha Stewart move by increasing the fat content. Fat is great for flavour but in excess it can actually have a negative impact. Instead of making a cake feel moist, too much fat will make it dense and heavy. Instead of making it moist, too much fat will make cookies feel greasy. Instead of making it moist, too much fat will make brownies also greasy and too soft. At the right proportions, butter adds mouthfeel, builds structure and adds softness. Too much of a good thing ruins this and that's why recipes are important. When fat is in excess in say, a butter cake recipe, it will turn out very dense and a bit stodgy because fat inhibits the production of air cells when you are beating the batter. The result is a cake with nearly no structure and lacking fluff. It will certainly melt in your mouth, but that's because it is mostly fat and that's what fat does. This recipe today features the golden ingredient in its modesty. 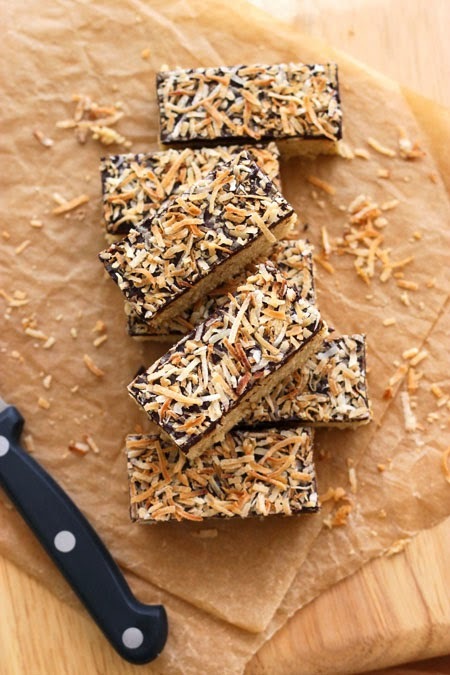 These Butter Bars are best eaten fresh, but will last 3 days in an airtight container at room temperature. They start by creaming 140 grams of unsalted butter with lovely brown sugar, vanilla and salt until the light and fluffy stage. You can imagine the wonderful butterscotch flavours that this will create. Only one egg yolk and flours needs to be added and you've built a thick but spreadable dough. The result is a chewy bar with incredible toffee aromas. They are chewy - not moist because there is no moisture despite the 140g butter. Adding a whole egg would bring liquid, but also dilute the flavour and inhibit browning. I live the deep golden crust that these get! 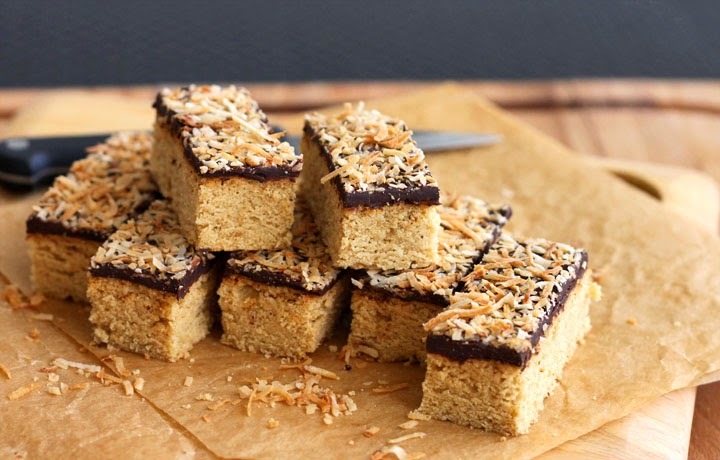 A coating of melted bittersweet chocolate folled by toasted coconut makes a really irresistible treat that borderlines on candy bar. A very sophisticated candy bar. Love it up! Cream the butter, brown sugar, vanilla extract and salt together until very pale and fluffy. Beat in egg yolk until well combined. Sift flour with baking powder over the mixture and gently fold it in until completely incorporated. The mixture will feel like a soft cookie dough. Turn dough out into prepared pan and press it in evenly but gently with your hand wrapped in plastic srap. Even out the surface with the back of a spatula. Bake for 25 minutes. 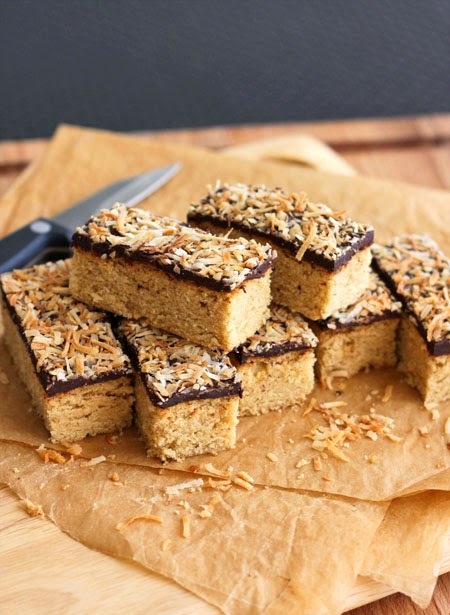 Spread the shredded coconut on a cookie sheet and put in the oven 20 minutes after the cookies have gone in the oven (keep an eye on the coconut, it burns easily). The base should be nicely evenly browned and will be slightly soft in the middle. Transfer base and coconut to a wire rack to cool completely. After the base has cooled, melt the chocolate in a double boiler over very low heat and spread it out evenly over the base. 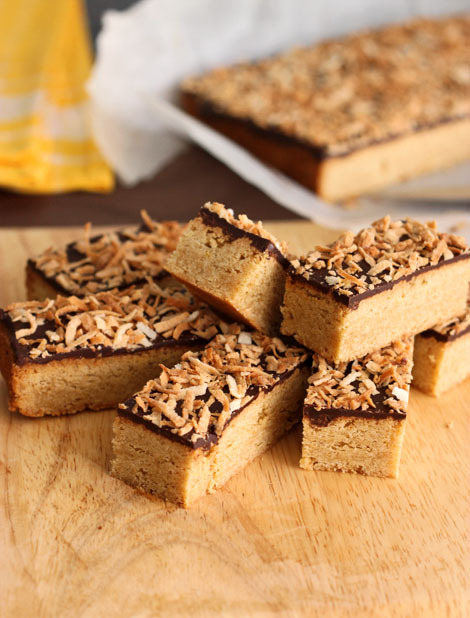 Immediately sprinkle toasted coconut on top, patting it down gently. Let the chocolate completely set and cut into squares and serve. This looks great and simple.